We are instructed in Philippians 4:6 to not be anxious. 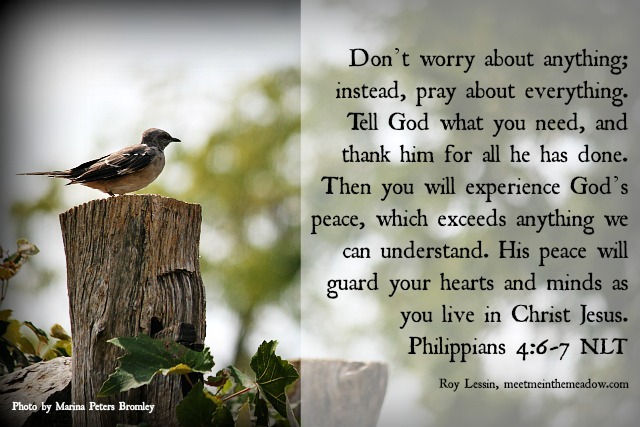 Instead, we are to talk to God about our concerns and express thankfulness to Him. A truly thankful person has made a habit no matter what to notice, to pause and to choose. Notice something for which to be thankful no matter the circumstances. Pause to acknowledge the circumstances as a reminder of God’s presence. Choose to focus on God’s presence and thankfulness until His powerful peace is unleashed. When thankfulness is proclaimed, the result is peace (Philippians 4:7)….wonderful, powerful, unexplainable, uncontainable peace. Write these steps out on a notecard. Place it where you can see if often. When you start to worry, follow each bullet point above and see God’s peace powerfully guard your heart. Have a grace full week of peace! This is Gods timing to read this today. We are praying and in need if clarity about moving out of state. I will be rereading this over and over. We must make a decision by next Mobday. So true! When we stop and see that God uses our trials to draw us into intimacy with Him, then we can face our circumstances with more meaning and anticipate His peace. Praying this for you, too Kath!